So, last month we were looking at the lead guitar style of Metallica’s Kirk Hammett. 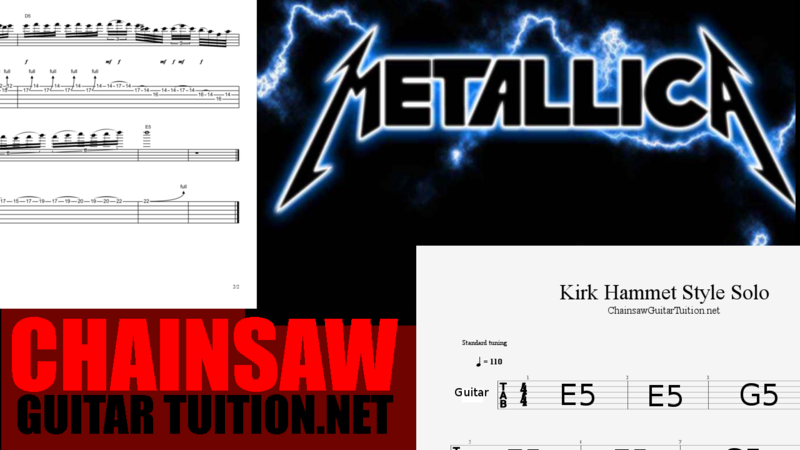 Then, at the end of the month I wrote this lesson on how to play and sound like Kirk. If you’re a fan of Kirk Hammett, I suggest checking that post out! Now, I’m more a fan of earlier Metallica (Black Album and earlier). So that’s what I based the lesson on. I think Kirk’s 90’s playing is a bit less interesting, personally (not saying the songs aren’t any good!). During that lesson, I played an example solo along to a backing track. The backing track was included as a download in the original lesson, but I thought it would be worth posting it here and going into a little bit more depth with the track itself. First, here is the track, which you can also download here. For the recording, I’m using an EMG-81 bridge humbucker into an emulated Mesa amp. The pickup is authentic to what Kirk would use, but the amp is not. This was just the best sounding one available. The recording is also very aggressive and rough sounding as I’m going for the earlier Metallica sound. This is also coupled with a heavy dose of reverb on the guitars (panned left and right). The chord chart is further down the page. This backing track is in the key of E minor. If you’ve spent any time at all jamming to Metallica songs, you’ll realise that they tend to be in either E minor, or A minor. This is true for a lot of the earlier songs. Later albums go into other keys, for example ‘Load’ and ‘Re-Load’ are tuned a step down (giving you E flat minor…). Go ahead. Stick on any album before the black album. 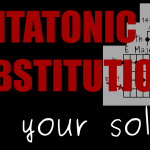 80% of the time E or A minor pentatonic will fit the song (just make sure you’re tuned). Therefore, it would make sense that this track is in the key of E minor. The chord progression I’ve used here is very straightforward. After all, we’re talking early thrash, not avant-garde Jazz! Here are the chords, which you can also download in .PDF form here. I’ll talk more about the progression (and which scales will work) further down. The first section is just an E5 chord for two bars, and then a G5 chord for the next two bars. Then the whole thing repeats. It’s fairly common in the band’s earlier songs to move the chord up a minor third like this (‘Nothing Else Matters’, ‘Creeping Death’ and ‘To Live is to Die’ all feature this movement). This is probably an influence from Iron Maiden. This section alternates between the root chord (E5) and the minor third (G5), which firmly places this section in the key of E minor. The second part of this chord progression uses another very familiar pattern for Metallica fans. If you’ve listened to the intro, or middle section of ‘Creeping Death’ you’ll know what I mean. 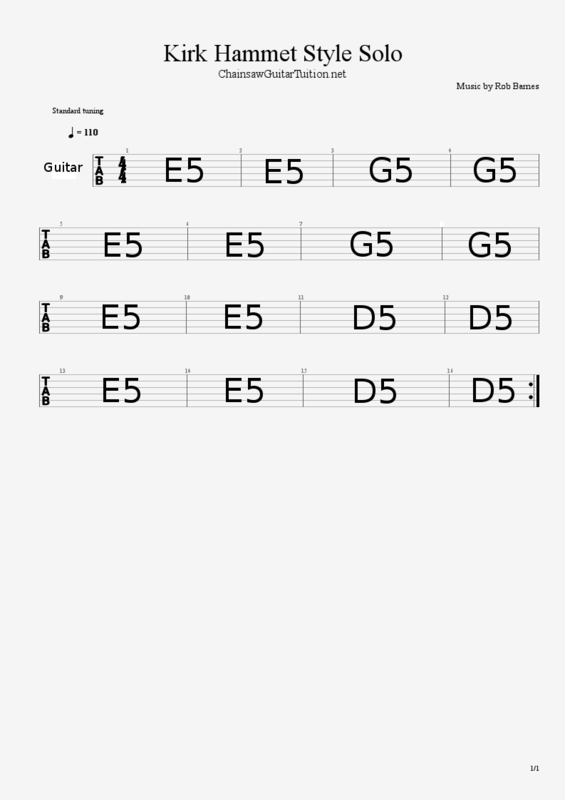 This is the E5 to D5 progression, which is also used in the pre-chorus to ‘Master of Puppets’ (“Come crawling faster…”). In theory terms, we’re going from the root chord again (E5) to the minor 7th (D5). This doesn’t so strongly suggest the key as the first part does, but it is still E minor. The great thing about soloing to this style of music is that power-chords only have two notes. 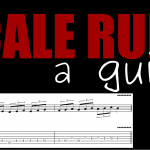 This gives you more options of which scales to use, and less ‘wrong’ notes to clash. For example, in the first section there is only an E and a G in the backing track. While the logical choice would be something E minor related, any scale with those two notes in could work. The first scales that spring to mind, then, are the E minor pentatonic, and E natural minor scales. These are definitely the best choice if you’re completely lost. The track is in E minor, so use E minor type scales. If you really want to sound like Kirk, I go into detail in this post about the equipment he uses. 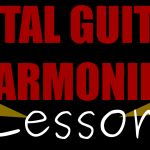 As for scales, you’ll probably want to use the Dorian mode or (less common) the Phrygian mode. The Dorian mode involves playing the D major scale over this progression. This would work well for both sections. Just remember that your root note is actually an E, not a D.
The Phrygian mode involves playing the C major scale over the progression. This will also work over both sections, as long as you keep in mind that your root notes are still Es. 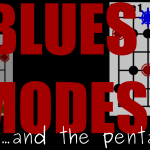 If you would like to know more about modes, then you might want to read this post, where I explain them. Although definitely keep in mind that this is a more advanced concept. 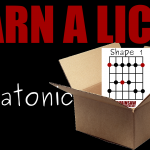 If it’s still confusing to you, just stick to using the E minor pentatonic or E natural minor scales for this track. If you would like to see what I play over this track, don’t forget to check out the “Sound like Kirk Hammett” post linked above.